I have switched to the dark side of the internet! – A good cooking blog and especially on baking - make my day. Just received my King Arthur Spring Baking catalog - leaf through looking quickly, as I know their products well, I see a new recipe “Joy’s Triple Berry Cinnamon Swirl bread” – Oh my goodness golly I thought to myself as I read the recipe,,..heck, I don’t have fresh berries in the house - not really in season in February in Virginia! 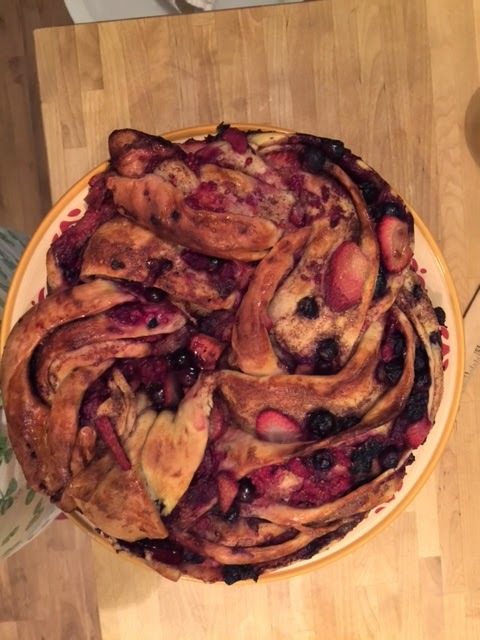 So I went to her blog “joy the baker” and did not see, to my dismay, any recommendation for using frozen berries. I feel confident I can use frozen as long as they are drained properly - out of the freezer the berries came, but went to store and purchased some fresh too to play it safe, I also stopped and purchased a new cast iron skillet - I only have one skillet and one Dutch oven, but I want to find one that has higher edges and use for the sweeter items I bake. This weekend not only did I make the Triple Berry, I also made some healthy muffins as well, using oat bran, whole wheat flour, and date sugar... Yes, they were yummy and no fat was involved.